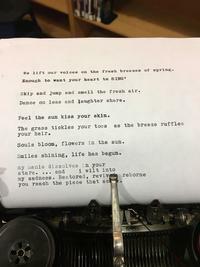 What if an entire community wrote one line each on a vintage Underwood Typewriter to create a really, really, long poem? Would it bring world peace? Would love abound? Would we become a united nation? One can hope, right? 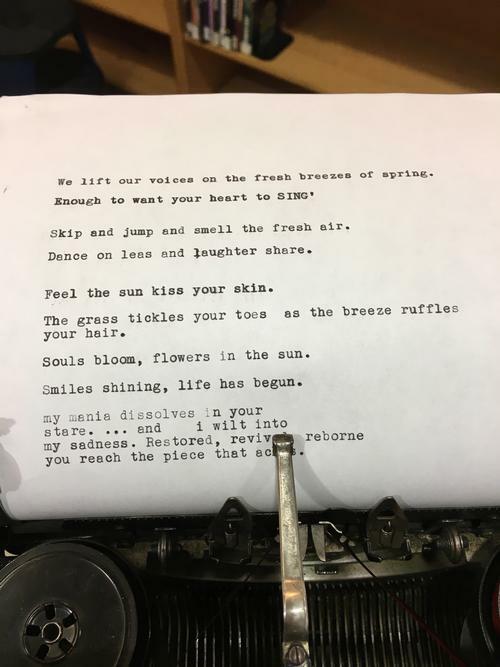 On April 3, South Philly poet, Maria Fama composed the first line of our poem. 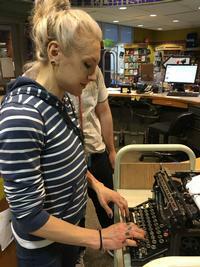 She pecked out her lines on the 1929 machine on loan from Philly Typewriter. By the end of the day, many others had followed suit. We've invited elementary and high school classes, local organizations, politicians and our library regulars to participate. By creating this program we are celebrating the written word and telling the world that words matter. The Underwood No. 5. was the most successful typewriter design in history. Appearing shortly before 1900, the Underwood established the stereotype of a typewriter until the introduction of the IBM Selectric in 1961. When the Underwood was first introduced, it was only one of hundreds of competing and extremely varied typewriter designs. But by 1920, almost every typewriter imitated the Underwood. It just so happens that April is National Poetry Month, not to mention National Library Week was just last week. This program isn't just for South Philly residents. Anyone can drop in and tap out a line or two. Stop by anytime when the Fumo Family Library is open to add your voice! Watch our Fumo Family Library Poem being written! Add a Comment to Are You the Poetry 'Type'?